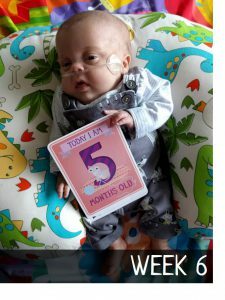 Last month we were lucky enough to be invited back to our neonatal unit to be part of their ‘Books for Babies’ campaign; an initiative launched after discovering that only around one in 50 parents read to their babies on the unit. 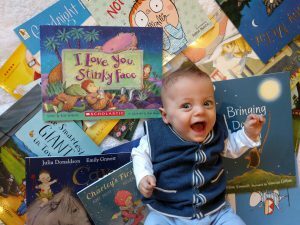 Every baby is now given a book when they are admitted in order to encourage their parents to read to them during their stay. In fact Henry was the poster boy for the launch and we were obviously very proud! As a teacher I am very aware that reading to children from a young age is hugely beneficial and greatly improves attainment later on. 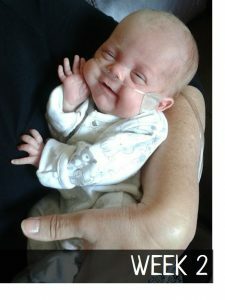 For the premature baby it can be the only thing that brings a sense of normality to parents in the beginning; when Henry was in hospital, at first we were not even able to touch him so reading was the only thing we could do that was part of our original plan, it was also important to us that he start to recognise our voices, hoping ours would stand out as soothing amongst those performing endless medical procedures. I also hoped he would remember them from being in utero. I wanted him to hear us speaking as much as possible but as much as I tried, I struggled to just talk randomly, some people are good at this, I am not! 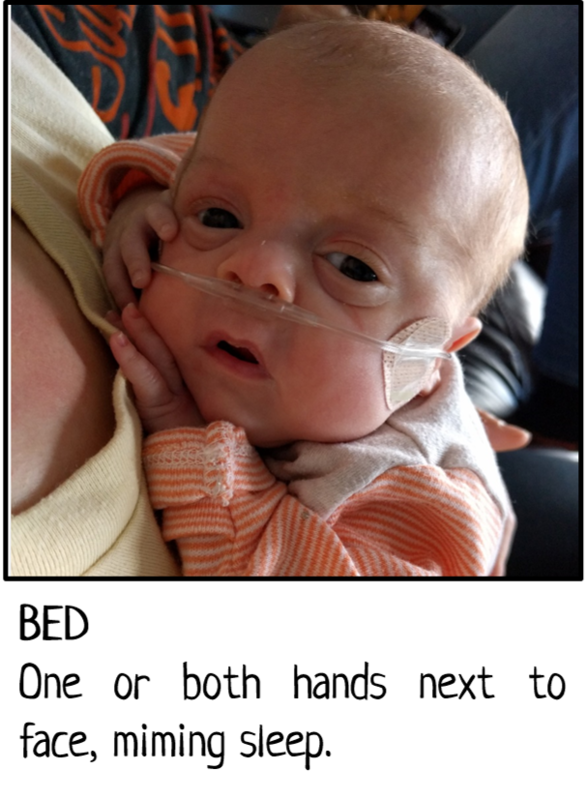 I found there was not much to talk about when sitting beside his incubator as I spent all day at the hospital and felt I had very little to tell him except what I had for lunch! 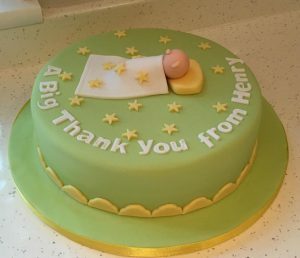 Reading books became a lovely part of our routine and Henry grew a bit of reputation for having a ‘mini library’ next to his incubator, with nurses often reporting that they had read some of his books on their night shifts! 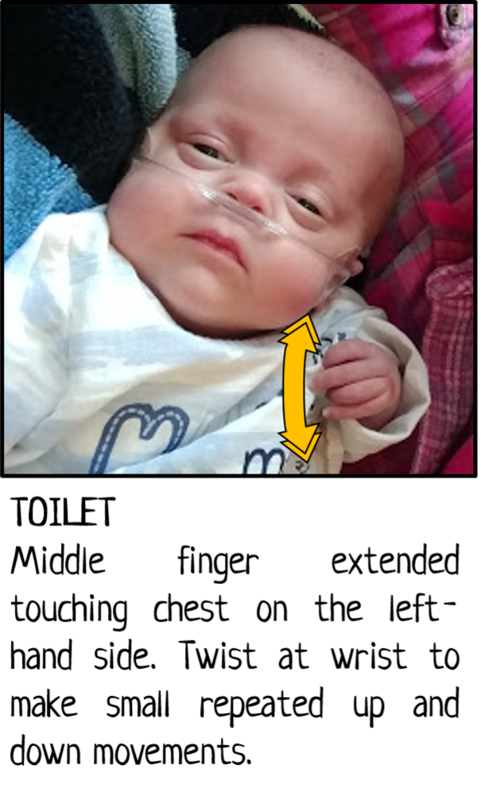 Not only is reading beneficial for bringing a sense of normality to parents but the research carried out by our neonatal unit suggests that the more you talk to your premature baby the better their language and communication skills by 18 months. Now that’s definitely a good reason to start shopping for books! 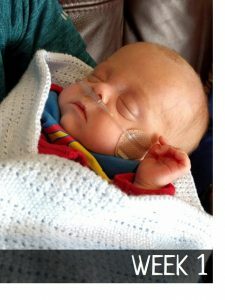 As mentioned in the video, I am currently writing a book for other parents of premature babies to tell them about their journey through hospital, this will be my next project now I have finished Henry’s book which you can read here . . . 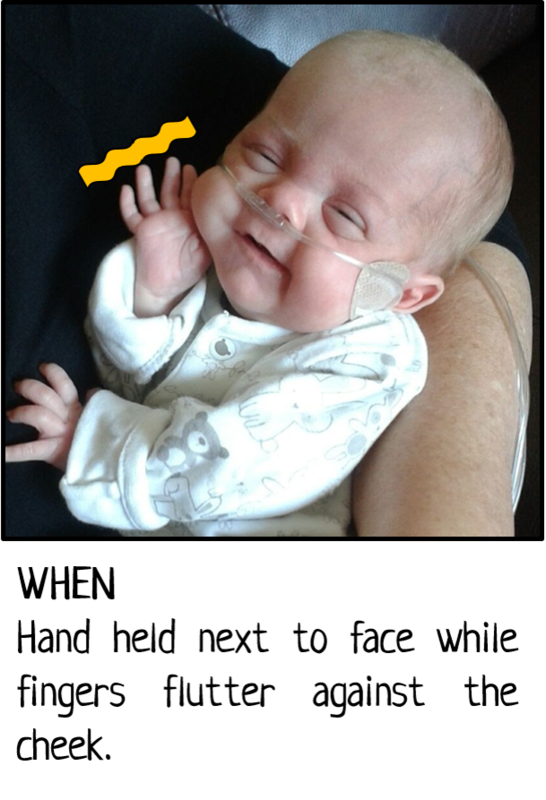 If you would like to share your experiences of reading in the neonatal unit please leave a comment below. 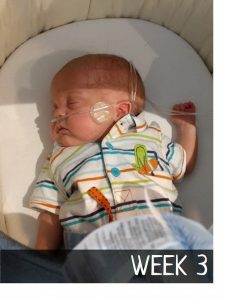 Last week was Baby Loss Awareness Week; this is an initiative led by various charities with the idea behind it being to offer support to those who have lost babies and also help banish the taboo of talking about them and that is why I am writing this post, not for sympathy or pity, but just to give an insight into the feelings surrounding the loss of a baby, both to increase awareness and just maybe help others who are going through something similar and may find my words relatable. I also get a lot of comfort by writing down my feelings. 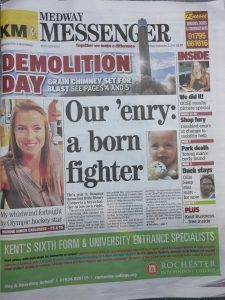 Obviously, in light of the events of the past year this is a subject that is now close to my heart, particularly regarding talking about the loss of a baby; I like to talk about Archie, he is my son and Henry’s brother and always will be and I feel that talking about him keeps his memory alive. I think of Archie on a daily basis but with this week being at the forefront of social media and in the news it has made me reflect a little more than usual which, in my view, can only be a good thing, reflecting, reminiscing and crying are part of the emotional scars I now carry and, I believe, are all healthy aspects of dealing with grief. I read once that the scars we are left with following the death of a loved one are a testament of our love for that person and if the scars run deep then so does the love, this is so true and why I will now gladly carry these scars as they are now forever part of me. This week was important to me as often we get carried away with day-to-day life and taking time for reflection doesn’t happen often. Due to a slight sleep regression on Henry’s behalf lately I’ve spent a lot of early mornings during the week reflecting and reading various articles, while keeping myself awake for feeding, and although I appreciate the thinking time by Saturday I was left feeling a little sad and empty as I waited for 7pm to arrive to light our candle in remembrance. That’s when I started to write this post and found the act of sharing my thoughts on this digital canvas made me feel a lot better. I really like how the week culminated with the ‘Wave of Light’ on 15th October; families across the world took part by simply lighting a candle at 7pm to join together in remembering all babies that have died too soon, in recent years it has entered the digital realms with #WaveOfLight, encouraging people to take part by taking a photo of their candle and posting it to Facebook or Twitter using #WaveOfLight at 7pm. 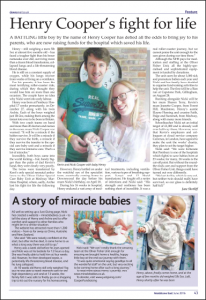 I thought of this as a hugely positive way of remembering Archie, uniting with other parents across the globe. It was also a significant date for my husband and I, as it was a year ago to the day that we found out we were expecting twins. It really highlights how much can change in a year but with all the miracles we were blessed with on those nights back in December last year, how can I ask for more? This morning I have been blessed with lots of smiles from Henry and despite awaking with a stinking cold I feel good, having had that time for remembrance, and immensely grateful for the beautiful boy currently snuggled up, asleep in my arms. Did you take part in #WaveOfLight? If so, feel free to share your stories in the comments below. 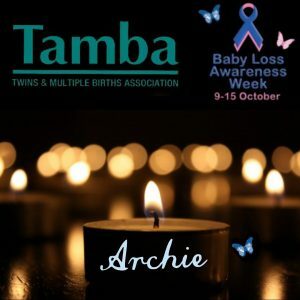 If you need support following the loss of a baby don’t suffer alone, Sands (Stillbirth and neonatal death charity), is a good place to start or for twin-specific loss, Tamba’s bereavement support group has been of great help to me. nicki September 28, 2016 September 28, 2016 No Comments on Fundraising Update! Now that our fundraising events for 2016 are finished I wanted, not only express our gratitude to everyone who has donated, but also share our achievements. So far, at the time of writing, I’m pleased to report that our grand total is sitting at £2,063! 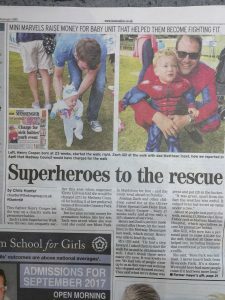 So let me tell you about our events this year; firstly at the beginning of July Henry’s daddy and a friend of mine stepped in at the last minute to join the Oliver Fisher Dragon Boat team at Mote Park, they had great fun and we may even look into putting our own team together next year. 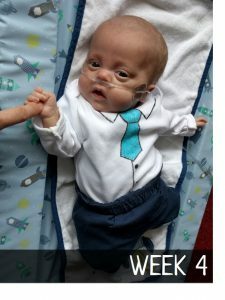 August was our busiest month in terms of fundraising; Henry’s nanny, who works in the Post Office in Maidstone, managed to get her team involved with raising money by dressing up as babies for the day when they celebrated their move into WHSmiths. The team raised a total of £201.53 which is going to be matched by the Post Office too! 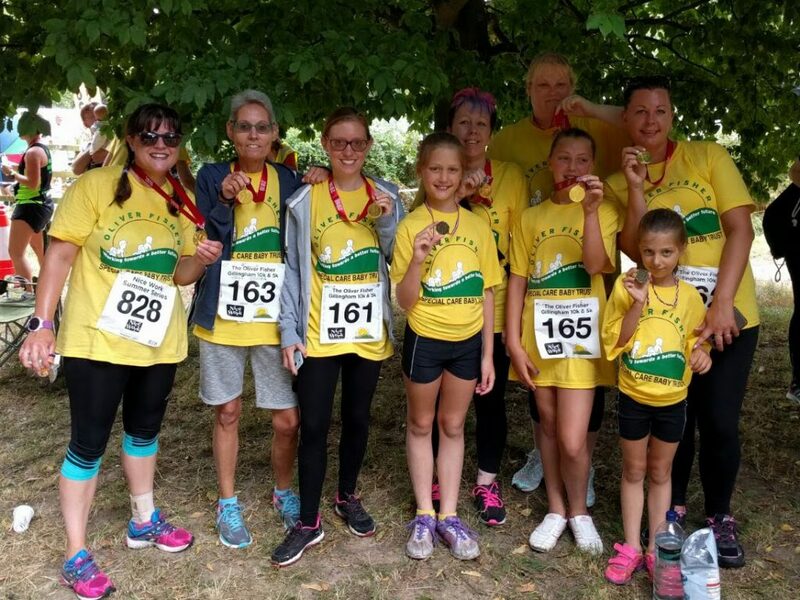 The end of August saw our main event which was the 5k run at Capstone Park. This proved to be a tough track with a huge hill at the end and although myself and Henry’s Grandma had intended to run the whole course the final hill finished us off, meaning we had to walk the last few hundred metres! Runners on the day were Henry’s cousins, Paige and Summah in the children’s race, then his other cousin Faith, mummy, grandma, nanny, auntie and friends in the main race. So that’s it for the fundraising for now, we’re not planning on venturing out too much over the winter months in hopes of keeping Henry away from any nasty bugs, but more on that later! In addition to the fundraising events, we did gain a little extra through fellow teacher donations from readers of my other website (www.interactiveclassroom.net), after sharing our story there we gained an extra £70. Kevin has also recently developed a mobile app for use with his electric unicycle (yes, you did read that right! ), he’s attracted quite a few users of his app and received a $100 donation in recognition of his work. Before I begin I just want to stress that I am not a professional photographer and what I am writing here is based on both research I have carried out and my own personal tastes when it comes to photography. I’ve just collated everything together in one place to make it easier if you are looking for some hints and tips. While pregnant I had always intended to take our boys to a professional newborn photoshoot, you know the ones, where the sleeping babies are bundled into super cute positions with their heads resting on their arms or tucked up in a little basket positioned just right. However, clearly life had other ideas and as Henry spent his 1lb 2oz “newborn” stage in hospital this plan obviously wasn’t going to happen. 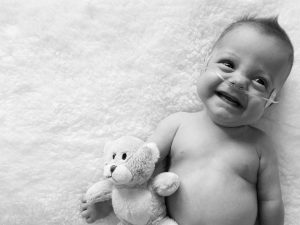 It is worth noting that a lot of these newborn photos are composite images (made up of multiple images), they are much more complicated than they look and should only be attempted by an experienced professional to ensure the baby is not harmed. 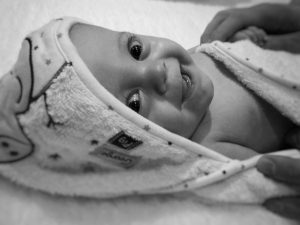 As Henry is now out of the newborn stage I thought I would have a go at some baby photography myself instead, mostly to save money as being on maternity leave means funds are a little short! In addition to this I enjoy taking photos and have always had an interest in photography. In fact I’m sure I drive my long-suffering husband mad with the amount of photos I take on holiday and days out! Thankfully, as you can see in the video below, Henry does actually seem to enjoy posing for the camera so that was one step in the right direction! Ensure the baby is lit from the top as this is more natural, after all, the sun is above us! 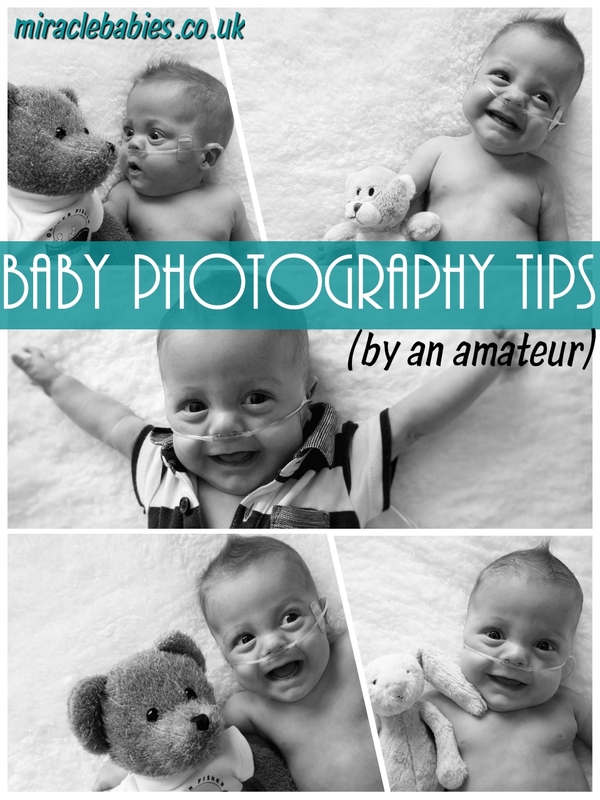 Lighting from below is usually associated with horror films so not recommended for nice cute baby pictures! Ideally, light from a window is best, I laid Henry down on the bed so the top of his head was facing the window and this seemed to work well. Shoot the pictures a little bit north of the baby’s nose so you are not shooting up their nostrils, this yields more flattering images and means the eyes are more of a focal point, after the video above I took a lot of pictures of Henry in his jeans but as you can see the camera wasn’t quite at the right angle and I wasn’t as happy with those pictures as the others I’d taken. Use a plain backdrop; I used a white fluffy blanket from Matalan for my pictures, I also replaced our play-mat with it for the day and ended up getting a few lucky shots as a result during play time, the picture on the right is an example of this and ended up being one of my favourites! Take lots of pictures at once and filter through them afterwards, vary the angle too so you have lots to choose from, don’t worry too much about framing the picture perfectly as this can easily be achieved through rotating and cropping a later. Avoid using the flash, I personally think the flash produces unrealistic lighting and also means you have to spend time editing the dreaded red-eye out of pictures afterwards! I’m sure it would irritate the baby pretty quick too! Try to make sure your room is well lit instead. Use props; I really liked capturing the interaction between Henry and some of his toys on camera which made for some really cute photos. Take cues from your baby. 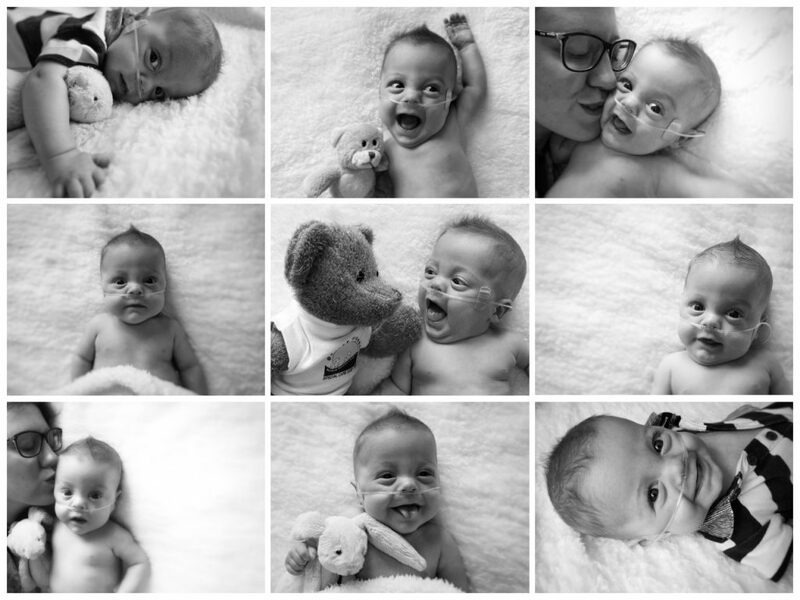 I carried out our main photoshoot after Henry’s morning feed and some baby yoga as that is generally when he is at his happiest but all babies are different, making a game of it also helps. 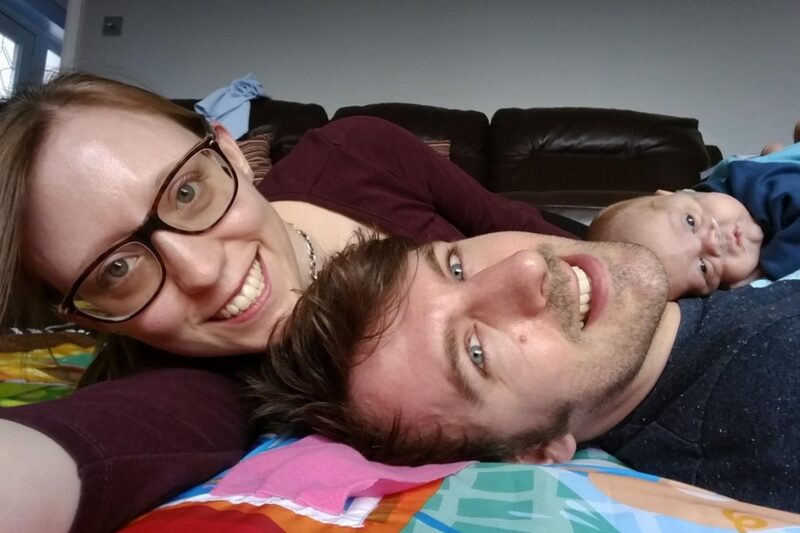 Stop before the baby loses interest, as soon as you know you’ve got a number of good shots stop, the last thing you want to do is miss out on some quality parent interaction time while your baby is awake and happy. Although I have a pretty decent camera I ended up taking all of my pictures using my phone due to issues with the SD card, although being a Nexus 5X it does sport a pretty decent 12 mexapixel camera. 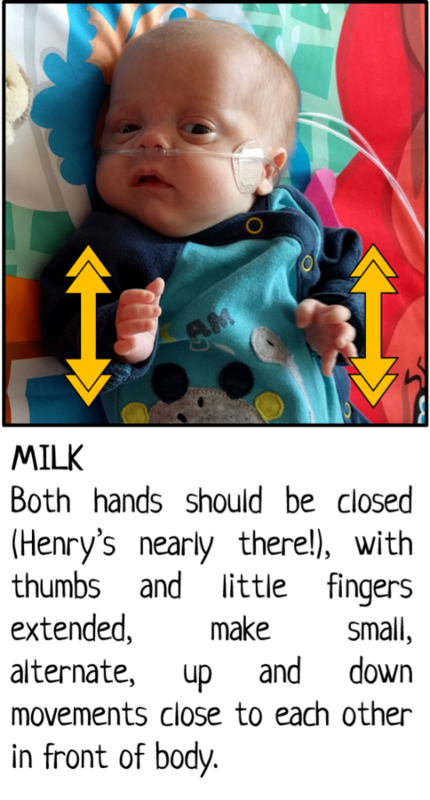 As a result I ended up using a mobile app called Snapseed for editing rather than Photoshop which would be my normal choice, however this did make it a little easier to edit one-handed while either feeding, holding or cuddling Henry at the same time! Snapseed also has a nice lens blur feature which allows you to mimic the effect of altering the depth of field, allowing you to focus on a specific area of the picture while blurring or softening the surrounding area, something a professional would achieve through the use of lenses, aperture and shutter speed. This works well if there is only one specific area you wish to focus on, such as the face for example. I used this feature less when I also had toys in shot as I wanted both Henry and his teddy in focus but it was effective for pictures of just Henry, I think it worked particularly well in the post-bathtime shot on the left to really make his face stand out against the surroundings. Most editing apps allow you to also change to black and white which I think makes photos look particularly eye-catching. Play with the different options when converting to ensure it looks as good as possible as some filters can make the photo look a little washed out, I quite liked the ‘bright’ mode and occasionally the ‘contrast’ option which gave a slightly darker look. The picture below was rotated to give a more interesting look and also cropped to remove the nappy from the shot. The following image did not require much editing, I just cropped to remove my hand and Henry’s nappy, I also have a black and white version. This last image was another lucky shot taken the following day. We were having a bit of a heatwave so Henry was only dressed in a nappy, I draped my trusty white blanket over the sofa, sat Henry up and just snapped away on the off-chance of getting a good picture, luckily Henry was pretty happy despite the heat and gave me a very cute smile, I just needed to crop out my hand and Henry’s nappy as well as pushing the focal point over to the left and adjusting the lens blur a little. I really like the composition of the end result here. Finally, a hair styling tip; breastmilk! Not overly important but I thought I would include it anyway as a few people commented on how they liked the spiked up look to Henry’s hair and this wasn’t an accident. Inadvertently, I had recently discovered that breast milk makes a good styling product when I used some on his head for cradle cap, naturally I had played around spiking his hair up afterwards and found that even after brushing the hair stays in the same position and goes nice and fluffy too! Check out my Pinterest board below for more ideas and if you have any suggestions feel free to add a comment! 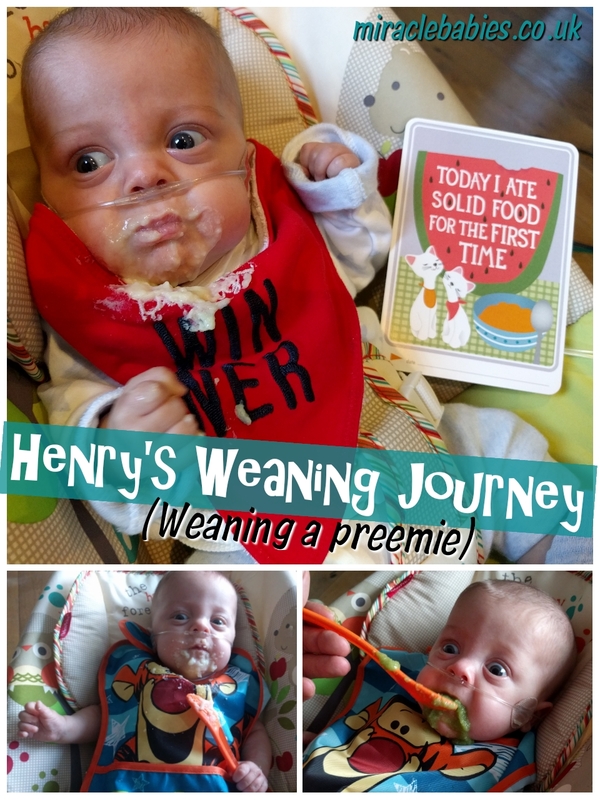 We started weaning Henry just over two weeks ago, just before he turned six months and we’ve been having great fun watching him enjoy some real food. 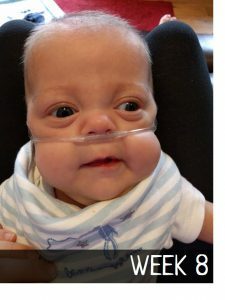 I wanted to share our experiences, along with some useful links in hopes of helping other preemie parents who might not know where (or when) to begin! 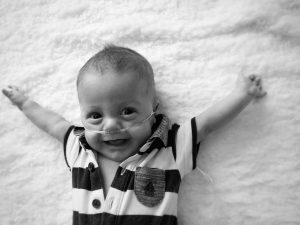 Firstly, when you have a premature baby a lot of developmental milestones are based on their ‘corrected age’ rather than their actual age, this is the age they should be had they been born on their due date. Weaning is a bit different since most will have been digesting milk since their birth or soon after. This does present more challenges than weaning a full term six month old as Henry isn’t at the stage of sitting unsupported or able to coordinate his hands well enough for the baby-led method of finger feeding, which would have been my preference. Not to mention that he is physically too small for most high chairs, currently being the size of an average newborn! 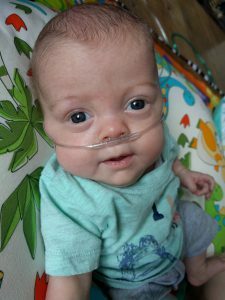 For these reasons it is important to get the go-ahead from a professional before you start and we checked with our outreach nurse before we began who referred us to the very useful Bliss guide called ‘Weaning Your Premature Baby‘. This is definitely worth a read before you start as it informed us that we need to begin with purees then introduce lumpier food after about a month. At this point weaning is really just about introducing different flavours and textures to a baby as solid food will not be a main source of nutrition until around ten to twelve months, for this reason it is important to keep up with milk feeds. So before embarking on our weaning journey I did some research into what kind of foods we should begin with and several studies have suggested a more savoury approach, beginning with vegetables. I had also read several stories about baby rice containing high levels of arsenic so wasn’t keen to start there! Looking at the NHS site however much of this was probably blown out of proportion by the media so I should stress that if you have started with baby rice the risks are very low, although a third of the baby rice tested in a study were found to have high levels they are unlikely to do any harm in such small doses. As a baby (and child) I was quite a fussy eater and my husband as a baby would only eat fruit so I really wanted to make sure we got this right. I had also read that it is best to begin with one flavour at a time when you first start and luckily found a very useful little guide on the Ella’s Kitchen website as part of their “Veg for Victory” campaign. 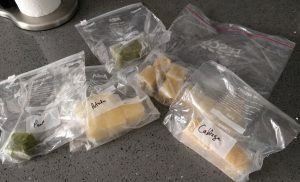 After establishing where to start I set to work cooking up a storm in the kitchen; steaming all the vegetables and portioning them out in ice cube trays, once frozen they can be transitioned into labelled zip-lock bags to save space and you can just pop out a veggie-cube whenever you need one. As predicted by the outreach nurse his first reaction to the food was to push it out as he had not yet learnt the tongue control to move it from the front to the back of his mouth, we have seen an improvement in this every day since we started and feel he is really getting the hang of it now, happily slurping the food off the spoon. It was suggested that if he really struggled with the spoon we could feed him from our fingers which we did with his first experience of cauliflower as he seem a bit unsure about this, however the second time he tried it he absolutely love it and ate the whole lot in no time! I’ve read that if a baby does not like a new flavour it should be tried ten times before ruling it out completely, however we’ve yet to find something Henry doesn’t like to test out this theory! 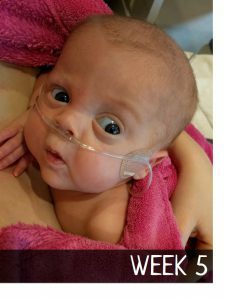 So far we have worked our way through Week 1 of the Ella’s kitchen guide over the past two weeks meaning Henry has had potato, brocolli, cauliflower, green beans, peas, avocado and cabbage each mixed with breast milk. We have just started to work through the Week 2 recipes which we will be continuing over the next two weeks giving Henry a taste of courgette, brussel sprouts, aubergine, carrot, butternut squash, parsnip and swede so I’ll be cooking these up during the week and freezing them in readiness. I’ll probably throw in some sweet potato too. There are some other handy guides to cooking and preparing various fruits and vegetables over on Buzzfeed and A Step in the Journey. Once we move onto more lumpier foods there are some nice recipes to try over on Jamie Oliver’s website and after around 10 to 12 months the plan is to start giving Henry mashed versions of the things we eat. 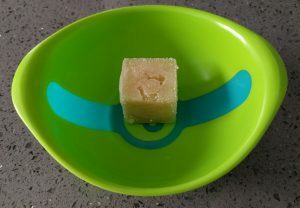 As I mentioned earlier, ideally I would like to have taken a more baby-led process with weaning by skipping the puree stage altogether (read more over on Dirt & Boogers), I really like this approach as I’m keen for Henry to have a healthy relationship with food especially being such a fussy eater myself as a child. Once he is able to hold his head and fit nicely into his high chair we will definitely be giving him some finger foods to try. 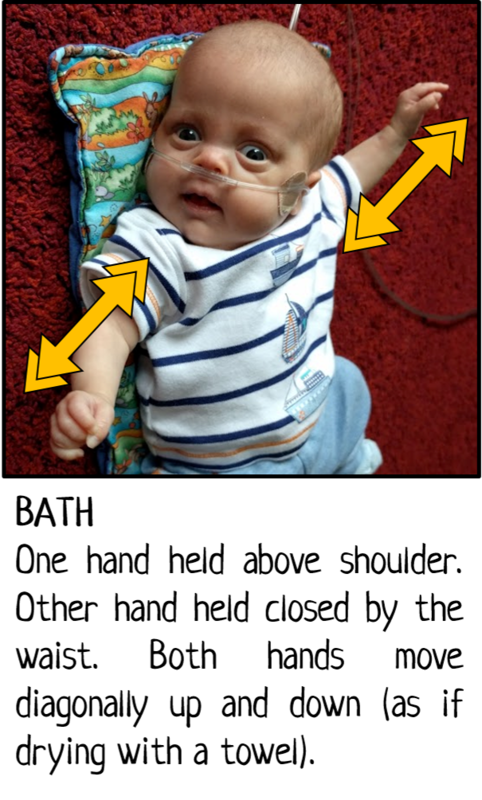 At the moment with the purees we do encourage him to put his hands in and get dirty as this is also beneficial from a sensory point of view. The final thing we had to address, not that Henry’s quite ready for it yet, is a high chair, there are so many on the market we really didn’t know where to start. 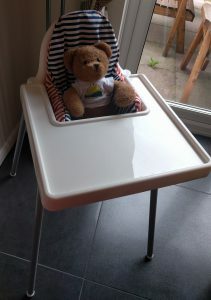 I knew by the time Henry is ready for a high chair he will be a lot smaller than most babies at this stage so wanted something accommodating. 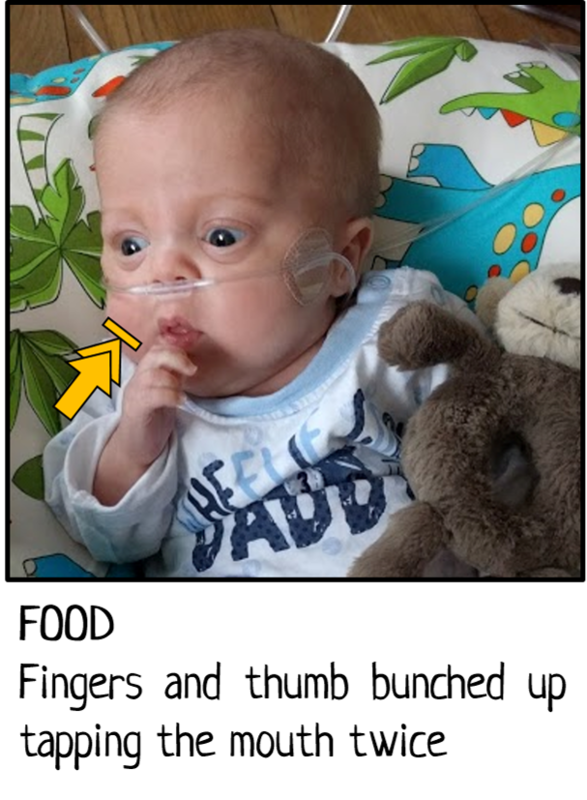 After a little research I came across the Ikea Antilop, it had lots of recommendations for being suitable for small/premature babies, particularly when you buy the blow up cushion which means the size is adjustable and even better is the reasonable £13 price tag! We haven’t tried it with Henry yet but our Oliver Bear (who is smaller than Henry) fits in it nicely! On several occasions we thought we may never reach this milestone; but here we are. Henry is six months old today! Despite the tough times we have had along the way we are so incredibly lucky to have this little man in our lives and are immensely proud of everything he has achieved over the last half a year. Every day he continues to amaze us and melt our hearts just a little bit more. Here is a video to commemorate his six month journey. Lately I have been reading a lot about the benefits of signing with babies. According to the articles I have read, this results in babies who are able to communicate their needs before they are able to speak. Parents reported less tantrums as they grow into toddlers as the child is able to express what they want without getting frustrated. One concern I did have was that maybe this would inhibit the onset of speech but from what I have read it actually has the opposite effect and children who can sign actually have a better vocabulary than their non-signing counterparts. 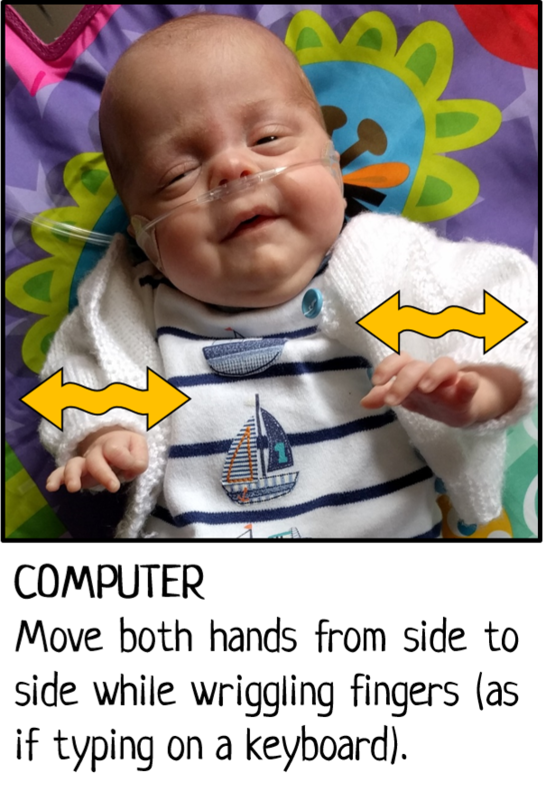 Of course every child is different and there is not going to be a hard and fast rule but with baby signing there is nothing really to lose by giving it a go and if it helps avoid some tantrums as Henry gets a little older then even better. 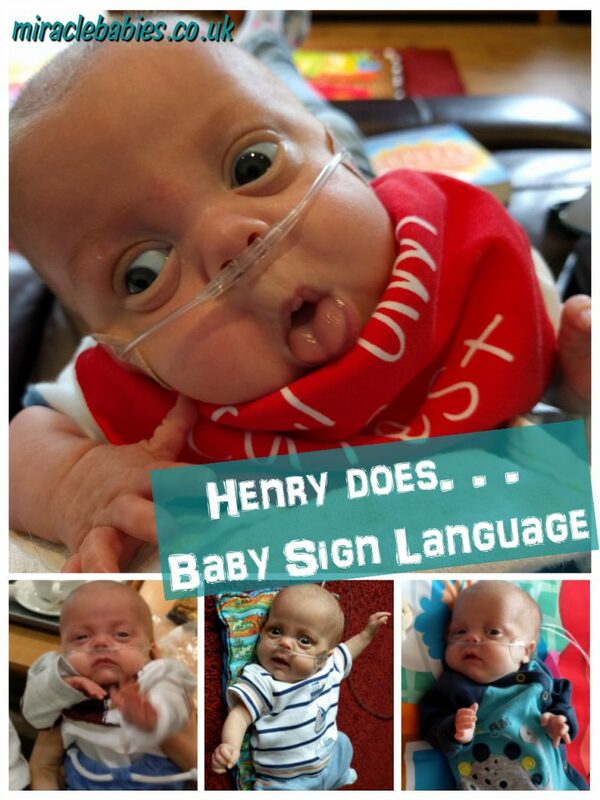 As Henry was so premature, at this point we do not know whether or not he will have any ongoing developmental issues, including communication and speech so to be on the safe side it seems sensible to introduce some basic sign language with him early on to hopefully alleviate any future frustrations. My husband actually required speech therapy himself as a toddler so this could be a distinct possibility with Henry too regardless of his prematurity. So when is the best time to introduce baby sign language? 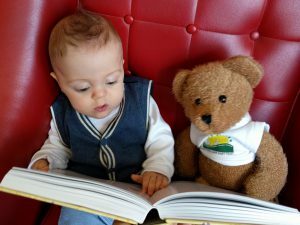 From what I have read, 6 to 8 months is the best time to get started, although for us this is a bit of a grey area as Henry has an actual age of 5 months and a corrected age of 5 weeks! As a result I have just started taking every opportunity to use the signs now as it’s not exactly going to hurt to start early, although the important thing is to not get frustrated if he doesn’t respond, most parents have reported that their babies don’t start to sign back until around 8 to 10 months (sometimes longer) so who knows when Henry will respond! I’ll put together some updated posts in a few months to let you know how we are getting on, for now, here is a start with some signs by Henry (okay, they’re lucky shots with the camera!). This is a quick reference guide to some basic signs. I couldn’t resist throwing “computer” in there as my husband and I are both computer geeks! (I’ll update the list above as and when Henry gives me some more opportunist poses). As Henry gets older we’ll no doubt introduce some more signs in addition to those discussed such as colours, foods and animals and I’ll blog about those at a much later date. Let me know what you think, or if you have any tips please share in the comments below. nicki April 30, 2016 July 4, 2016 No Comments on You’re Home. Now What? I’m writing this and reflecting after being at home for nearly two weeks. We have now settled into home life nicely, Henry is enjoying his new environment and has gained lots of weight now he has unlimited food on demand and we are all enjoying lots of cuddles. When we first came home there was, unsurprisingly, some initial worries despite being excited about having your baby home it can be quite daunting at the same time as you no longer have a team of experts on tap to discuss any concerns you may have. You find yourself worrying about everything at first, are they too hot? Are they too cold? Are they gaining weight? These are all normal and the fears start to subside once you get settled into family life, although there will still be times when you sit there watching your baby breathe, just to make sure! 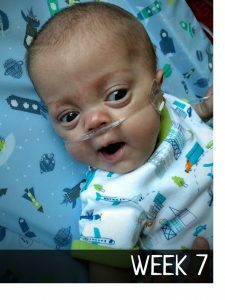 One surprising thing we also found at first was that we missed the routine of going to the hospital and more than that we missed the staff; for nearly four months the NICU became your life and the people are an extension to your family (they will no doubt see a lot more of you during that time than your actual family!) We have actually found ourselves looking forward to visits from the outreach nurse and follow-up appointments just to touch base and say “hi”! 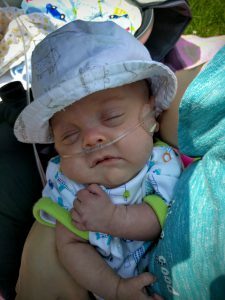 People should not visit if they are unwell, even a common cold can make a preemie baby very sick. Visitors should remove shoes and wash hands when entering the house. Also use hand sanitiser before handling the baby. Due to a vulnerable respiratory system visitors should not wear strong perfume or aftershave. 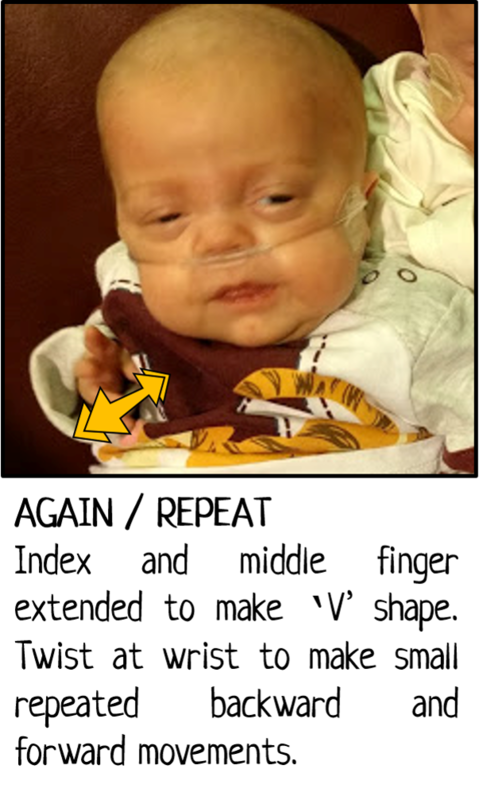 Visitors who smoke should change their clothes and not smoke before visiting, even the smell of second hand smoke can aggravate a preemie baby’s sensitive lungs. 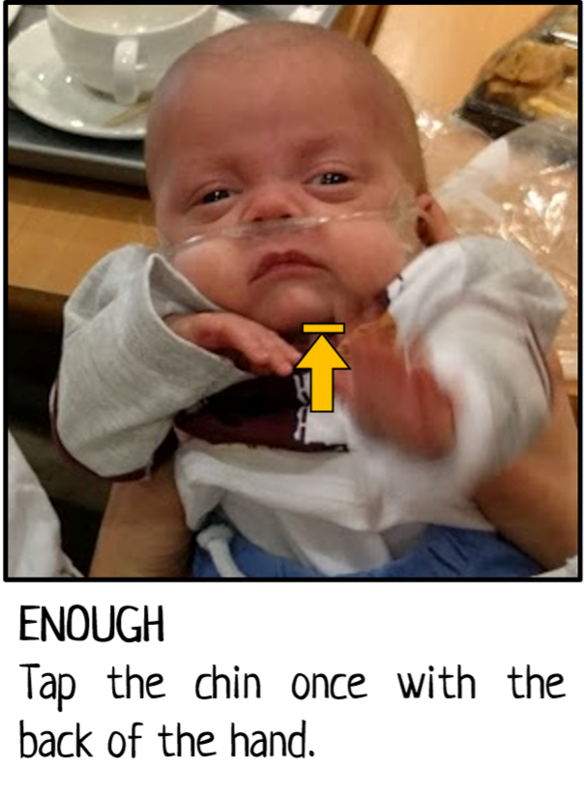 If it is RSV or flu season visiting is not advised as preemie babies, especially with Chronic Lung Disease are at highest risk for complications like bronchiolitis, pneumonia, and other serious breathing problems that could put them back in hospital. 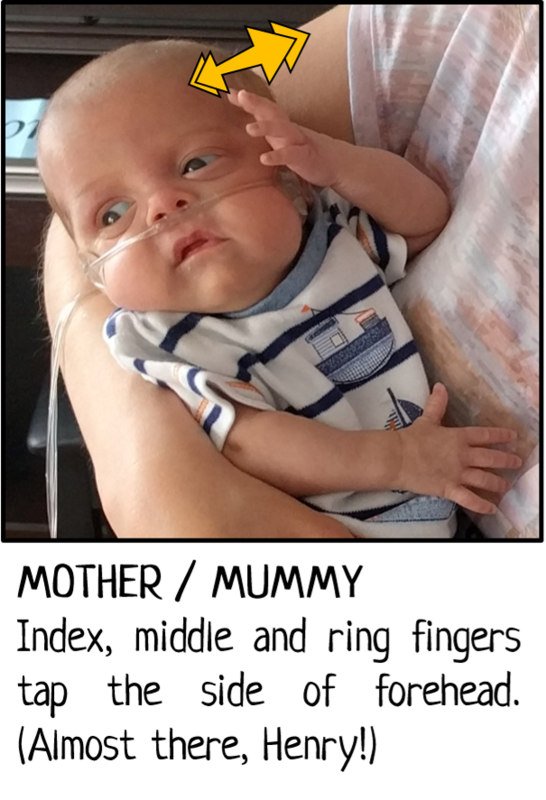 Visitors should check with parents before visiting and be mindful of how long they stay as preemie babies can get overstimulated easily. If the baby is sleeping he or she should be left to sleep. Finally, the really exciting thing about having a baby home that has spent time in hospital is that you appreciate everything they do. Kevin and I get excited every time Henry does a burp after feeding, we both enjoy changing nappies, no matter how smelly, and when Henry has me up for several hours during the night I just think of it as an opportunity to catch up on the cuddles we missed out on while he was in hospital, because leaving him there every night was the hardest part. Well, that’s it for now. If you have similar experiences to share, please leave a comment.